5/3/2016–Hillsborough, NC–Lt Col Pete Bohler was the lead instructor for the Urban Direction Finding Team (UDF) course held on Saturday, 30 Apr 2016 in Hillsborough, NC. 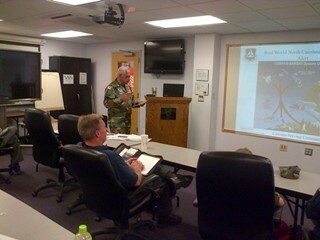 During the course, students learned how to locate an airplane’s ELT (emergency locator transmitter.) Class participants came from the Raleigh-Wake Squadron and the Orange County Composite Squadron. Col Bohler taught the UDF class to meet each student’s needs – ranging from experienced CAP pilots down to teenage cadets. The morning classroom session covered a variety of UDF topics including safety, team alerts, radio frequencies, the CAP Grid system, map reading, compass usage, communications, paperwork and log requirements, and the use of LPERs and other UDF equipment. During the afternoon session, students were dispatched as two separate Ground Teams to Occoneechee Mt. State Park and tasked with locating a practice beacon. Both Ground Teams successfully located the practice beacon using their LPERs. Following the field work, a comprehensive debriefing followed at mission base. The Orange County Composite Squadron gratefully thanks Lt Col Bohler, Lt Col Richardson, Major May, Col Crawford, Maj Bailey and all the other Wing personnel who helped make this UDF training possible.